While we are not yet ready to develop solutions (this will happen in the Adaptation and Invention stages), now is the time to set an Impact Goal. This is a clear and brief statement of the specific external impact you wish to create through your product, process or service, towards which all other elements in your work are orientated. A good goal statement is expressed in terms of the change in conditions we wish to make and help clarify the direction we want to go. Defines a current status of things. Articulates an improved end state. 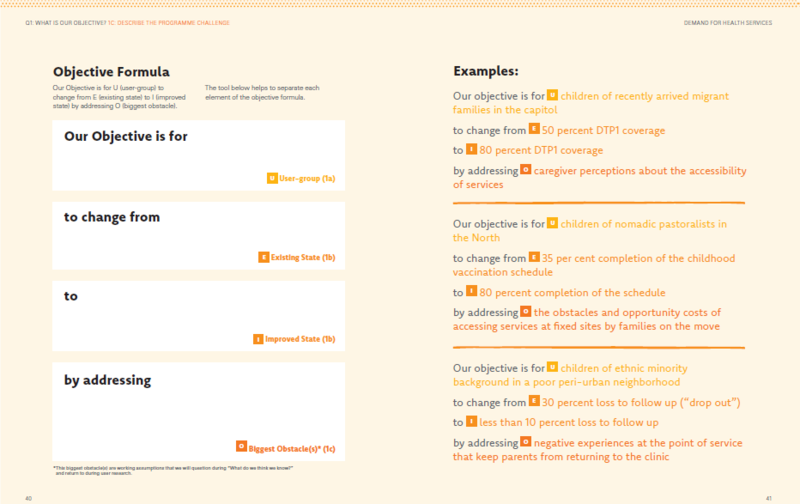 The UNICEF Guide (See p40) will help you prioritise and define the population or group that requires attention. It is important to identify and prioritise the specific kinds of actors to be served, and the particular needs they encounter, and that must be resolved or addressed, (a) in the effort to achieve the goal, and (b) in order to work deliberately towards delivering real value to users. Identifying target users and their needs helps clarify, guide and prioritise the selection of design criteria. Many different kinds of users can likely benefit from the services offered or the functions performed, etc. But setting out to be useful to everyone (eg, ‘the entire humanitarian and innovation ecosystem’) can lead to a lack of focus, and therefore deliver a lack of value. If you need to carry out some pre-work to help you with this process – particularly if your problem area is complex – you can carry out a ‘visioning’ exercise. The UK Government’s Futures Toolkit has a good methodology for doing this. UK Government Office for Science (2017) Futures Toolkit.